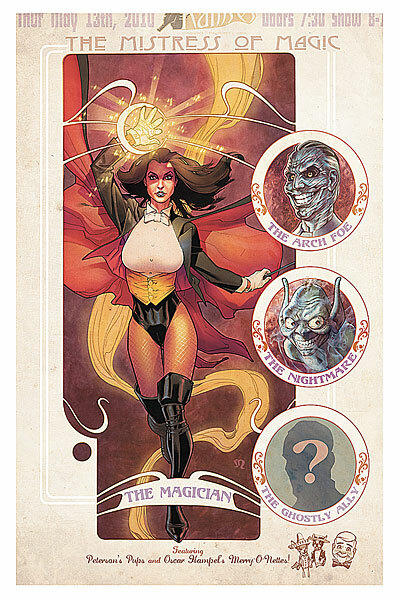 Last month DC Comics started a series focusing on the character Zatanna who is a stage magician with real magic powers. To advertise this new comic, they’ve been using these two banner ads online. 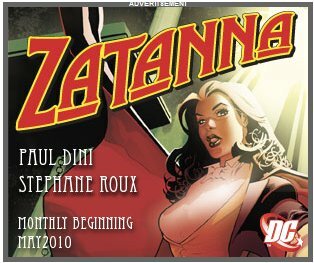 What I love about these banner ads is that they have the feel of old carnival posters, which is very in line with Zatanna’s character and theme. Even better, they’ve carried this idea through to the actual covers of the comic as well! This is the cover of the second issue. I love the poster feel and I could see the cover actually being a poster. Actually, they should totally make poster versions of this cover. Sadly, they probably won’t, since Zatanna doesn’t have a red S or a bat on her chest. Too bad. Basically, I think this is one of the most appealing, appropriate marketing campaigns I’ve seen from DC in a very long time. I hope they keep doing interesting and fun things like this! These are the kinds of marketing campaigns that make me want to read new comics! This is a trailer for the movie You Again. This is one of those trailers that gives you a situation rather than a plot and you’re sort of left wondering if the whole movie is just the situation from the trailer drawn out longer or if there is actually more plot and for some reason we just aren’t getting shown what it is. The problem is that both types of movies exist and one type really works (the type with a plot) and the other usually doesn’t (the type that’s just a situation drawn out for an hour and a half). So how are we supposed to know from this trailer if the movie is of the first type, and thus more worth seeing? Luckily for this particular movie, they had Betty White and while the people who made the trailer may not have made the most compelling trailer for the first two minutes and fifteen seconds or so, the last clip with her was brilliantly chosen. It stands on it’s own, is surprisingly funny and showcases a humor and actress that we haven’t seen throughout the rest of the trailer. She may not have completely saved this trailer or even made the nature of the movie any less confusing, but Betty White’s brief moment of humor at the end there made the movie more appealing and memorable and that just might be enough to get a few more people to see it than otherwise would have. This is a current commercial for Friskies cat food. My husband and I saw it while watching a television show on Hulu and were both so baffled by it that we had to pause the show and go find the ad on YouTube and watch it again to see if we’d imagined how bizarre it was. We hadn’t. Now that I’ve seen this ad a few times, I realize that it’s actually even stranger than I realized on that first viewing. I have no idea what the people at Friskies were thinking when they made this ad because this seriously seems to tell viewers that Friskies pet food is laced with LSD or some similar hallucinatory drug. If I had a cat who ate Friskies, I’d switch brands immediately. The thing is, I’m pretty sure Friskies isn’t laced with LSD (or even with Cat Nip). It may not be the very best cat food out there, but I don’t think it’s the equivalent of feeding your cat street drugs either. Still, the commercial shows one seriously messed up cat trip. It may look all cute, but think about this for a minute. What’s wrong with that cat? It’s in a happy fun world filled with it’s favorite food that are all just begging to be stalked and killed – frolicking cat-sized turkeys, ambling cat-size veal on four legs, dancing fish and chickens practically laying themselves out at the cat’s feet. But what does the cat do? I would have expected it to chase and probably eat the animals (they’re food, right?). That’s not what it does. It lazily strolls among them, almost like they’re it’s friends. It’s eerie. Cats don’t do that with prey. That’s not a cat who realizes it’s in kitty paradise – it’s a cat who’s so strung out that it no longer realizes there are tasty meals dancing around it just begging to be pounced on. That is not a healthy cat. Friskies may have been trying to show a happy, wonderful human version of a happy cat, but anyone who actually has a cat will tell you that a real cat wouldn’t be happy like that. A real cat would go crazy in such a fantasy world where they couldn’t chase the prey that’s everywhere. And that’s why I have to stick with my original thought that I’d switch brands to something other than Friskies after seeing this, because Friskies clearly doesn’t know cats. Besides, on the off chance the food is laced with LSD, I’d rather be safe than sorry. A friend of mine sent me this set of banner ads for Angelsounds Fetal Heart Rate Monitor. I have no idea if the second ad is missing a word or if there’s just an extra apostrophe, but the sentence as it is isn’t terribly clear, since either you’re listening to something that isn’t specified or the ad is aimed at the small percentage of people expecting multiple children at once (twins, triplets, etc.). The image and the placement of the words could indicate that you’re listening to your baby’s footsteps, but if your baby is taking footsteps while in your womb you have bigger things to worry about that what it’s heart rate is! Basically, I find these ads really confusing. There might be a perfectly reasonable need for a fetal heart rate monitor at home during pregnancy, but I’m unaware of what it would be. As far as I knew, you could reasonably go your entire pregnancy only having the fetus’s heart monitored during visits to the doctor and while actually giving birth in a hospital. I can totally understand a midwife wanting such a device, but I’m not clear on why an expectant parent would need one. And the one year warranty kind of made me laugh, since I doubt most people would get any use out of this for more than a few months. I mean, what do you do with it after you give birth? The friend who sent this to me said that the ad also suggested the device would strengthen the feeling of being a mother. This also seems odd to me. It seems to suggest that women need their maternal feelings strengthened and I have to wonder how hearing the baby’s heartbeat through a device is supposed to do that when, presumably, feeling the baby actually kicking your internal organs daily isn’t apparently doing it. I mean, it seems like the woman who isn’t sufficiently feeling maternal from what she can already feel of her baby as she carries it isn’t likely to be suddenly turned onto the feeling by a blipping on a speaker. Besides, who’s to decide that a woman isn’t feeling motherly enough? The ad seems to suggest that it’s aimed at the mother herself, but this does seem more like the kind of thing you get as a gift than something an expectant mother actually buys for herself. And if you’re giving the gift to help the woman feel more like a mother, that’s somewhat insulting to her. As if you’re saying “you aren’t motherly enough, so I got this to help you (or maybe make you feel guilty about your lack of motherly feelings)”. Basically, I can completely understand these devices needing to exist. I just think that this is a pretty insensitive and thoughtless way of advertising them. 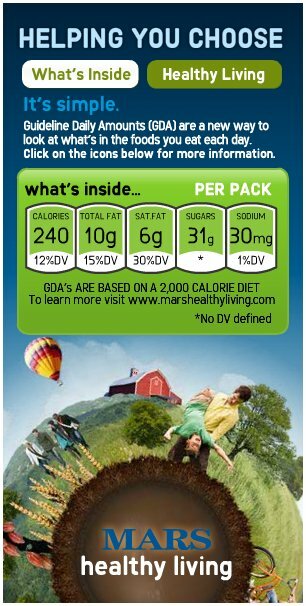 Although, apparently the people making the ads didn’t feel the need to even proofread them, so perhaps thought is asking a bit much. Still, this feels very callous and money-grubbing. It could be worse, but that’s never an excuse. This is an ad from 1979 for Oil of Olay facial cream. Well, at least we know from this commercial that looking young and products that make impossible and fuzzy promises about helping you do so has been around for at least the past several decades. Which makes me sad. When the guy shows up in this ad it suddenly reminded me very much of watching a cheesy soap opera. I’m not sure if it was because of the corny line, the over-the-top poses or the dripping-with-fake-emotion voice. Still, the comparison made me laugh.